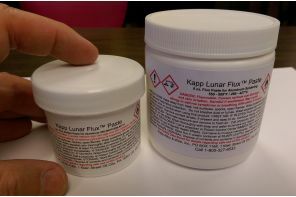 Kapp Lunar™ Flux is a white paste for the high temperature soldering of Aluminum and Zinc Diecast alloys. It is a reaction-type flux with 70% active ingredients dispersed in alcohol. The paste stays where it is applied to simplify the soldering process. Kapp Lunar™ Flux has considerable shelf life stability, as the suspending agents prevent separation and re-crystallization of the active ingredients. The performance of the paste in depositing Zinc on Aluminum and Diecast surfaces is also consistent over time. Any alloy/application for Aluminum soldering which demands working temperature range of 550-800°F (288-427°C). CAUTION: WHEN USED WITH ALUMINUM, TOXIC FUMES WILL BE GIVEN OFF. PLEASE READ AND UNDERSTAND THE PRECAUTIONS AND PROCEDURES ON THE SAFETY DATA SHEET . The following chart represents the physical properties of Kapp Lunar™ Flux. Many factors, such as materials, temperature, and method of application determine the most effective flux. Call Kapp for engineering assistance to discuss your specific needs. We recommend testing appropriate fluxes in your specific application to ensure suitability.